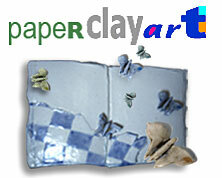 ceramic paperclay (P'Clay®) for artists and makers. A site by Rosette Gault, Ph.D, MFA. The most versatile, eco-user-friendly, affordable, high performance P'Clay® ceramic paperclay on earth, in kiln or out. Kids can "handle it" too.